Then call me personally to get my expert opinion on your next exterior home improvement project, you won't be sorry; you'll be making . . . "The Wise Choice, Since 1985"
Way back in 1985, a young 23 year old vocationally trained carpenter named Terry Sage got his Maryland Home Improvement Contractor License (#23485) as a General Contractor/Salesman just 6 years after graduating from Sparrows Point Senior High School as a National Honor Society Member. Since then he's used his skills he's learned through life and as a former Boy Scout of Troop 427 in Edgemere Md. to rise in the ranks of contractors in the Baltimore metro area. 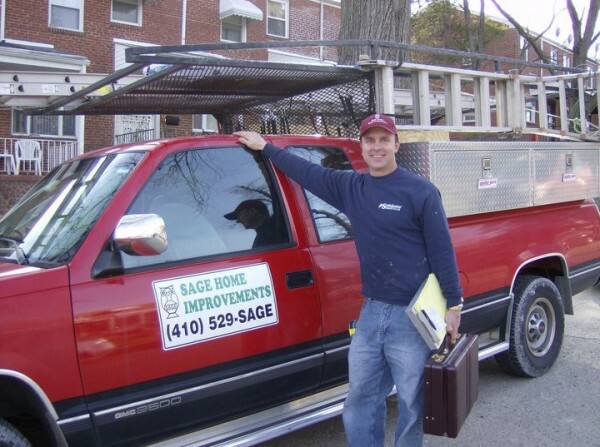 In 1995, Sage Home Improvements became incorporated after serving as Vice President of the National Association of the Remodeling Insustry(NARI) of Central Maryland for several years. Fast forward to the 21st century, and he's still the same hands on, honest proprietor he was since his humble beginnings. Thanks for the outstanding job you did on our patio door! You delivered our custom door on time; and, also took your time and seemed to really enjoy your work too. All at the most reasonable price we could find ! Sincerely, J.P. & Linda Lamb - Edgemere,Md. We just wanted to again let you know how thrilled we are with the new windows and doors you installed for us ! Feel free to use us as a recommendation to any future customers. You won't be disappointed with Sage Home Improvements !!! Larry and Mary Tuley, Perry Hall,MD. Sage buys directly from the manufacturer thereby, saving money on the materials that distributors and big box companies mark up to a higher price. Then he personally measures and sells every job for accuracy;thus, less mistakes that commissioned salesman and subcontractors can make on a project. There is no high rent, fancy showroom that adds to your final cost, because he brings the showroom to you in the comforts of your home, which has to be inspected anyway. All this adds up to big savings for you! I also carry other brands of windows at your request. "You can use me as a reference for replacement windows ", after replacing all of my windows in our home."